Whether you are starting your own business or a well-established small business owner, you are likely using QuickBooks, the most common accounting solution for small business owners. If so, Power BI provides an easy and better way to visualize your business data and get better insights. By simply logging in your QuickBooks Online accounts, Power BI automatically generates customizable, mobile-ready dashboards and reports for you. If you have other data sources like market research or cohort trending analysis, you can easily combine and analyze them in Power BI. In the highly competitive world of small businesses, Power BI helps you stay further ahead of the game. 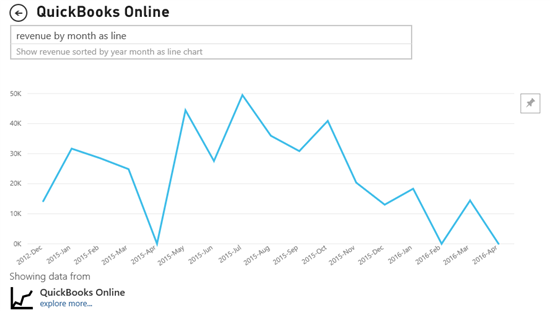 In this post we’ll cover how to get better insights from your QuickBooks Online data using Power BI. For additional details on how to connect and get started, see the QuickBooks Online content pack for Power BI. 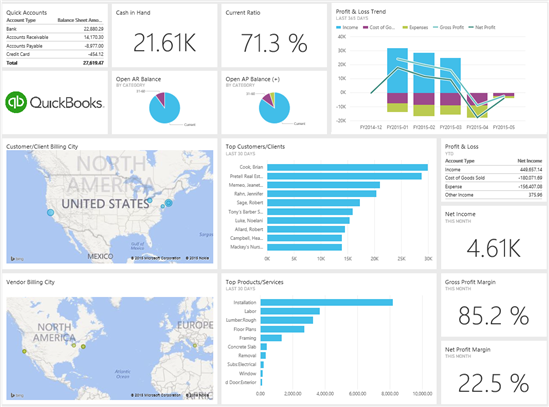 Power BI offers an out-of–the-box content pack that connects to your QuickBooks Online account and brings in a variety of important data for you to track your key business metrics. As soon as you are connected, you see your cash flow, profitability, customers, and vendors all in one place. 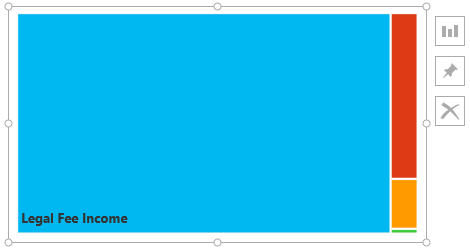 If you want them presented in a different way, just drag and drop to resize or re-organize them. The data will automatically be refreshed daily, keeping your dashboard up to date. Want to see more details behind the tiles? More breakdowns for your “QuickBooks accounts”? Just clicking a tile takes you to your balance sheet, where you can further slice by your Report Basis and Fiscal Year right on the report. The Filter pane on the right also gives you more switches and knobs to show your data with additional perspectives. Read more about interacting with Power BI reports. Many tiles on your dashboard lead to this 10-page report that comes with it. Use the navigation at the bottom to browse the other pages of the report, including Profit and Loss trend, Cash Flow, Customer Center, Vendor center, Prior Year Profit and Loss Comparison, Actual to Budget, and more. These reports are interactive: Selecting a particular value in one visual cross-filters the other related visuals on the page. You can also choose to edit the report, customizing your reports and dashboards based on the underlying dataset. Select Edit Report in the top left corner. The view will switch to show you the field list, allowing you to access any of the values and calculations included in this out-of-the-box dataset – additional information about expenses, income, and customized calculations such as current ratio, gross profit, cost of goods sold, etc. Read more about editing Power BI reports. Selecting a visual brings up options — to change the visual type, to pin the visual, or to remove it from the report. Pinning a visual adds it to your dashboard, and is a quick way to customize your dashboard with information that’s important to you. Back on the dashboard, you can also ask specific questions about your QuickBooks Online data, such as “revenue by month” or “top customers by income”. The results of the questions can also be pinned to your dashboard. Read more about the Q&A question box. Are you ready to get started? 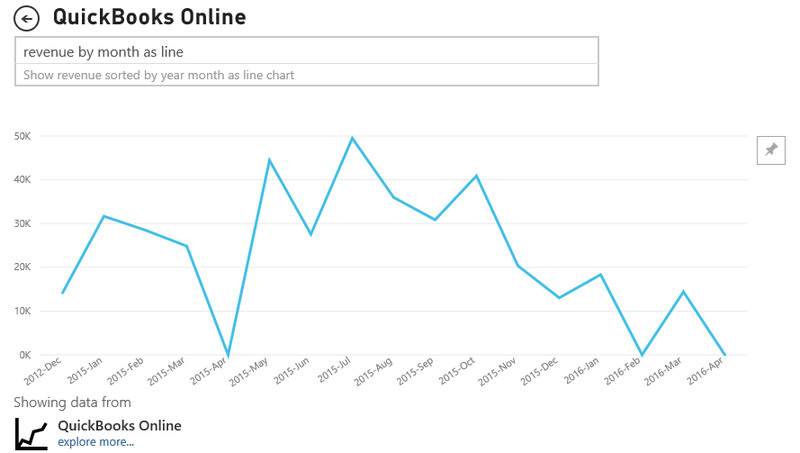 See how to connect to the QuickBooks Online content pack for Power BI. Not already a QuickBooks Online customer? Go to QuickBooks Online to learn more. We’re always interested in hearing your feedback – please leverage https://support.powerbi.com to let the team know how your experience was and if there’s anything we can do better. We look forward to your feedback!